Have you recently purchased a firearm, but, don’t feel comfortable firing it? Have you been around firearms your entire life, but, need assistance with certain firearms? Have you been in the military, but, miss being able to hone your skills? Have you thought about obtaining a Concealed Carry permit, but, haven’t had the time? Have you had the desire to become a better shooter, but, reached a plateau? 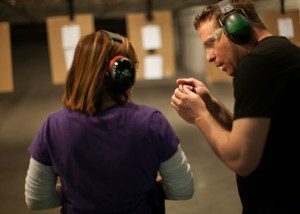 Have you considered taking a firearms training class, but, are short on cash? We will teach you not only to become a better shooter, but, also develop your confidence at work and in your day-to-day activities by knowing you have what it takes to survive. When our clients commit their time and energy to our rigorous lessons, they will leave with improved skills, greater confidence, and the ability to apply what they have learned. The first step is to submit a Registration Form (see below), and you are under no obligation to improve your skills. We want to learn what your goals are and what you wish to accomplish. Together, we will determine your current level of comfort with various types of firearms. To do this, we will ask you a some questions, and it only takes a few minutes. This enables us to develop the most useful lessons for you; there is no minimum proficiency requirement for prospective clients. Shortly after your consult, our highly experienced trainers will formulate a lesson plan tailored specifically for you, and we will work together to determine an optimal schedule. All training is conducted in a classroom setting and/or at The Range. Please Contact Us with any questions you may have. . .